True Story | The Book Cafe! What do you do when your life’s story cannot be told within the confines of the autobiographical genre? Its simple, you create a complete new genre to depict your life. Genres are anyway just constructed categories to arbitrarily fit works of literature into water tight compartments leaving no room for them to be seen as fluid, independent works. In the book, Lorde examines her life with all its ups and downs by intertwining incidents of her life with elements of the world around her. It is not just a retelling of a life, but a close examination of the life while also intermingling the historical aspects that might have affected her life. ‘Zami: A..” tells the story of a young Lorde who is a child of hard working black immigrants from Granada, living in New York in the 1940s/50s.. The earlier part of the book focuses on her childhood and teenage years. 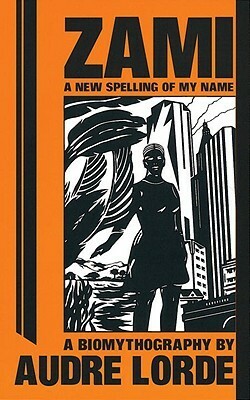 The book is not the usual run of the mill bildungsroman type but rather a book that fuses the elements of poetry, fiction, autobiography, history and myth to tell an intricate story of her life in New York, in Harlem and later on when she moves to other places like Mexico. Throughout the narrative, Lorde has juxtaposed the events in her life with significant events of American history such as the Great Depression, the World War II, the independence struggle of the British colonies, McCarthyism, the black freedom struggle etc. It gives you a sense of the larger world and a minute history lesson as well. It enables the reader to put the time frame in perspective. Through the lens of the broader events, Lorde reflects on her life, rethinks her political awakening, her understanding and acceptance of her sexuality, her femininity and her position as a minority in America. Her marginalisation creates in her a political impulse, a need to confront the mainstream hegemony on her own terms. Lorde chronicles her relationship with her family, their growing differences ideologically and otherwise, her numerous relationships with various women, her life in poverty, her life of constant struggle and pain, her close knit group of friends, the close sisterhood she developed as a student which enabled her to become independent and many other things. Lorde admits in the book that is tough to be a coloured immigrant in Harlem, tougher to be a woman and even tougher to be a Black woman immigrant lesbian. She is a minority in all senses but throughout the book she never allows this to marginalise her further. She finds ways to deal with them and the best way is to accept her individuality. Instead of moping around about her minority status, Audre finds hope in many ways and one of the ways is through her community of female friends, companions, girlfriends, other politically like minded people etc. She never allows any of her pain to close herself to the world but rather reaches out to the world to find people like her and find solace and comfort which helps her to assuage her pain. ‘Zami: A New Spelling Of My Name’ is a tender yet tough look at the trials and tribulations Lorde faces as she grows up and comes into her own. To read an e-version of the book, click here. It may not be one of the greatest books, maybe out of print and may not even be about the best musician on the planet(though for some he definitely is! ), but nonetheless, it is one marvellous novel that must be read. 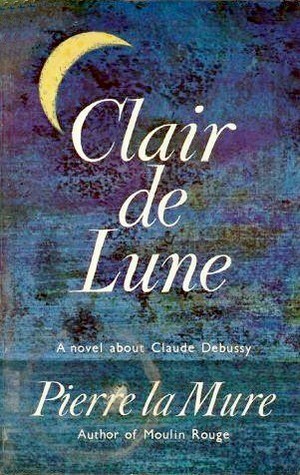 ‘Clair De Lune‘ written by Pierre La Mure is a biography of France’s best musician and composer, Claude Debussy. Before you stop reading the review further because the word ‘biography’ has put you off, I must tell you that the biography is very much a novel, a story of his life rather than a collection of boring essays of Debussy’s life by other people.It is written beautifully tracing Debussy’s life from his birth to his eventual/sad death. La Mure wrote about Debussy’s life like a intricate story so much so that the reader is one with Debussy in his travails and success. There is not much in the sense of a plot in the novel which is quite obvious as Pierre is writing about a true, famous French musician and not a fictional character. Yet I will give you a short summary. The book starts with his aunt and her reflection of her motherly love for Debussy. She recalls his birth and how she convinced his parents to let him stay with him in Paris. His aunt recognized his talent and arranged piano lessons for him. His musical talent got him admission in the Paris Conservatoire. He even won the Prix De Rome. However, because of the difficult and experimental nature of his music, Debussy wasn’t able to impress many composers who dismissed his work as difficult to play. Debussy therefore continued to struggle and remain in poverty partly because of this and partly because he did not grab opportunities when he saw them and was not business minded. It was only after his opera’s performance,’Pelleas et Mesilande’, that Debussy tasted success and his music was appreciated. He was finally able to uplift himself from his crushing poverty. He died in 1918 in the middle of World War I due to cancer. Mixed with his musical life is his very colourful love life. He had affairs with several women which is greatly described in the book. How much is truth and how much is dramatization in this biography I cannot judge. However, I am guessing that the love affairs that have been focused and etched out so vividly have definite touches of fiction, probably given to increase the reader’s curiosity and make them want to buy his novel. And that is one of the negative points in the book. It tends to focus more on his turbulent affairs than his music. He comes across as a womanizer than as a composer because of this. The book does mention that music was his first love but this love is never demonstrated elaborately. His music is relegated to the margins quite often which is quite disappointing. (Though it is quite fun reading pages and pages of love making he had with his love interests!) Another very disappointing aspect is that the novel exalts Debussy, creates a perfectness in him that is impossible in any individual, justifies all his actions and portrays him as a victim(particularly when it comes to his mean actions with his love interests). Besides all these drawbacks, ‘Clair De Lune‘ is a breathtaking work, a beautifully crafted biography that ignites the life and times of the great misfit musician. It pulls the reader into the bygone latter years of the 19th century, paints a stunning, opulent, luxurious,enchanting picture of France and Paris and other European places that Debussy visits. The emotional ups and downs, the tempestuous love affairs, the harrowing poverty, the fantastical music moments and the astonishing success seep into the reader making it difficult to tear oneself away from the book’s magic and come back to the dreary,music-less 21st century world! ‘Clair De Lune‘ is a novel that is not to be missed. One does not need to be a music expert to read Claude Debussy’s life story. The book never throws a lot of confusing music jargons that laypeople won’t understand. One can however, fall in love with his music because of this novel and that won’t be futile as his music is pretty darn good with its melting, lilting, dreamy qualities. It is sure to be a heart stirring experience! Do check out this book and his wonderful music. They are both worth the time and money! 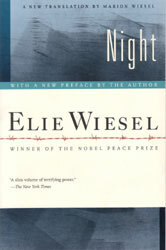 ‘Night‘ by Elie Wiesel is not a book for the faint hearted or for those looking for a casual read. The book maybe thin but don’t judge it by the size. Its profound impact on the reader goes beyond its volume. The book deals with the Holocaust-one of the brutal genocides in 20th century. Wiesel was just a teenager living in a nondescript town of Sighet in Transylvania when the Nazi troops came and bullied all the Jews into ghettos and eventually the concentration camp. Wiesel was separated from his mother and sisters and had only his father along with him. ‘Night‘ is a heart wrenching autobiographical account of Wiesel’s own horrifying experience in several concentration camps-from Buna to Auschwitz and eventually to Buchenwlad. It talks of unimaginable horrors that Wiesel himself suffered and saw all around him, being meted out to countless Jews in the camps. It records Wiesel’s own struggles, his gradual disillusionment in God, his numbness towards all the suffering around him, his love and support for his father and the eventual disappearance of that support, of innocence and the appearance of a self centered thinking that was sowed by the brutality he witnessed in the camps. The reader sees the transformation that Wiesel went through and how life in the concentration camps made animals out of humans, how it sapped the hope of the most optimistic person and sapped the most devout person of his faith. Page after page will make the reader cringe, force him/her to feel the pain, ponder on how anyone could survive such colossal pain, ponder on how such a mass genocide was allowed to take place. Hopefully the book will etch the story in the reader’s mind forever so that they never forget-Wiesel’s aim in writing this book in the first place. Hopefully, readers will remember the Holocaust, because as Wiesel puts it,”to forget the dead would be akin to killing them a second time.”(pg. XV,’Night‘ by Elie Wiesel,Hill and Wang Publication, First Edition,2006). Moreover, what I hope the readers will take away from this book, is that we, as readers, should intervene if and when such genocides happen because Holocaust is by no means the last such genocide. They keep happening and continue even in the 21st century-the so called progressive age. It is imperative that we learn from history, from one man’s ordeal that such horrors must never be allowed to happen because that strip humans of the humanity that we are all entitled to.